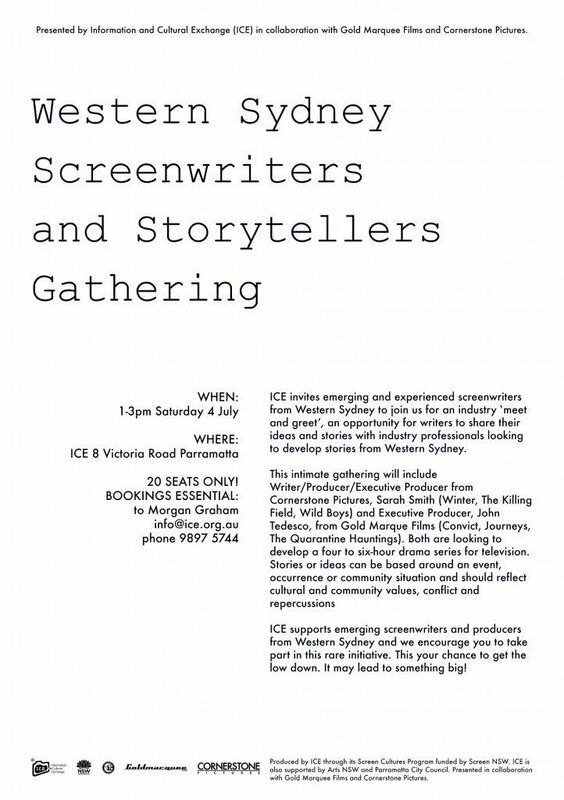 ICE invites emerging and experienced screenwriters from Western Sydney to join us for an industry ‘meet and greet’, an opportunity for writers to share their ideas and stories with industry professionals looking to develop stories from Western Sydney. This intimate gathering will include Writer/Producer/Executive Producer from Cornerstone Pictures, Sarah Smith (Winter, The Killing Field, Wild Boys) and Executive Producer, JohnTedesco, from Gold Marquee Films (Convict, Journeys, The Quarantine Hauntings). Both are looking to develop a four to six-hour drama series for television. Stories or ideas can be based around an event, occurrence or community situation and should reflect cultural and community values, conflict and repercussions. 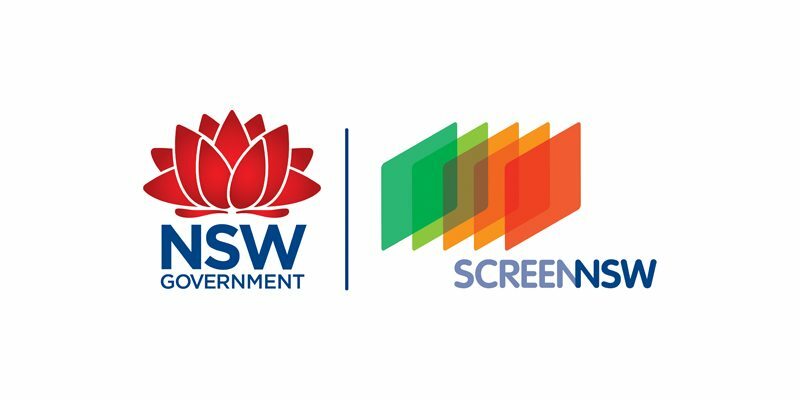 ICE supports emerging screenwriters and producers from Western Sydney and we encourage you to take part in this rare initiative. This your chance to get the low down. It may lead to something big! Produced by ICE through its Screen Cultures Program funded by Screen NSW. ICE is also supported by Arts NSW and Parramatta City Council. Presented in collaboration with Golden Marquee Films and Cornerstone Pictures. Executive Producer, John Tedesco started his TV producing career back in 2000 working with production company NothinButShorts when he completed the successful lifestyle show called Journeys which took viewers on an exploration of famous trips such as Route 66, Cappuccino highway and the Royal Pub. The show aired on cable TV and in-flight programs where it was regarded as fresh creative and innovative. Following the success of Journeys, John went on to work on Superset Tennis, reality TV content such as Search For A Rally Star and Unsigned & Unplugged which both highlighted the best in sporting, rally driving and music talent. One of John’s compelling sport shows Sports Worship looked at the phenomenon of following a sporting team and focused on what it means to fans around the world and the religious sacrifice they would make to support their team. John also produced TVCs for major corporate giants like Konica Minolta, Jardine Lloyd Thompson and Nestle. In addition to TV, John has produced the theatrically released feature film Convict which has been critically acclaimed has a hard eating gritty prison film. John’s recent film The Quarantine Hauntings opened late January and due for home entertainment release in August 2015. He has also distributed films such as Bad Parents across various territories around the world. John’s current slate includes a feature film adaptation of Henry Miller’s Tropic of Capricorn, a Lifestyle DIY TV show with Karl Champley & Ellen DeGeneres and remake of Boney TV crime series. John is a professional member of the Screen Producer Association/Screen Writers Guild and has a strong production team around him to develop and complete commercial high grade TV content and feature films. Sarah Smith is an AWGIE award winning creator, writer and producer. Her six-part drama series Winter, recently aired on the Seven Network in Australia and was the number one drama in its time slot. This was commissioned on the success of the telemovie The Killing Field, which she co-created and produced in association with the Seven Network through her company Cornerstone Pictures. Previously she created and was showrunner on Rescue Special Ops, which enjoyed three successful seasons on the Nine Network, winning a gold medal at the 2010 International New York Film Festival and the critically acclaimed Wild Boys, an action-packed 13-part mini-series set in Australias 1860s which premiered with the highest ratings on the Seven Network in September 2011. Sarah co-wrote and produced the award winning telemovie, Dripping In Chocolate, a romantic detective thriller for UKTV/BBC Worldwide and the feature film, Nerve, with director Sebastian Guy, which premiered at the Sydney Film Festival in 2013. She has worked as a writer, developer, and producer on some of Australias best loved dramas, including Old School, Wonderland, McLeods Daughters, The Alice, Sea Patrol, All Saints, Canal Road, and Neighbours, as well as popular childrens series, Blue Water High, Ship to Shore, Fast Tracks, Foreign Exchange and Minty.